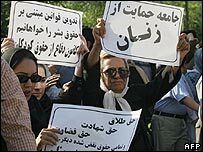 Police in Iran have beaten a small group of women activists trying to hold a protest for greater legal rights in the biggest square of the capital. Several people were arrested by the security forces who moved in almost as soon as activists started gathering. About 20 women sat on the grass in Haft-e Tir Square in central Teheran and began to sing a feminist song. They were calling for equal divorce and custody rights and a ban on polygamy. The police who massively outnumbered the protestors, almost immediately started beating the women to disperse them. The viciousness of the police attack caused men who were passing by in the street to protest, our correspondent says. "These are our sisters, how can you do this?" passers-by shouted at police. The women then gathered again on the other side of the square, but the police used pepper spray against them and onlookers. The women activists had advertised their action in advance on the internet where they said they were calling for an end to Islamic laws they believe are discriminatory.